Utah organizer wants legislation that demands more transparency and accountability — including independent civilian review boards. 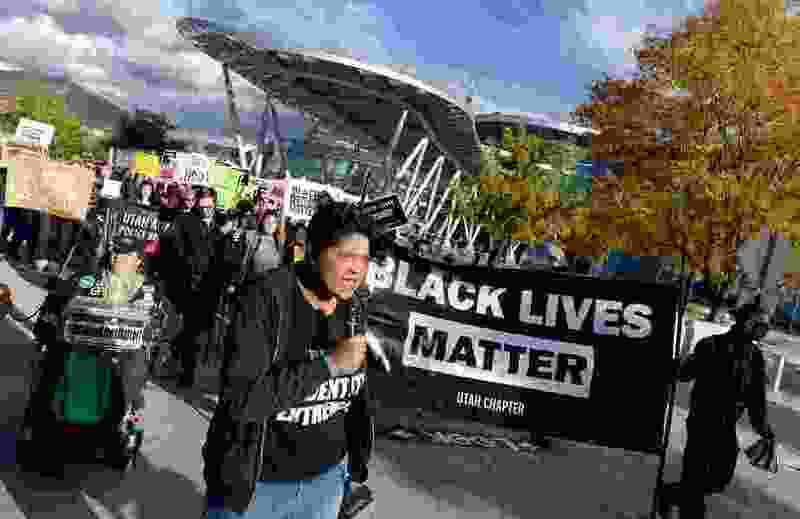 (Francisco Kjolseth | The Salt Lake Tribune) Lex Scott, founder for the civil rights organization United Front Party, leads a march to demand justice for the killing of Patrick Harmon, who was shot by police on Aug. 13 when he tried to flee after being stopped on his bicycle. Around 150 people gathered for the rally at the Salt Lake City Public Safety Building on Sunday, Oct. 8, 2017, demanding Salt Lake County District Attorney Sim Gill be fired for his "justified" ruling in the case. Lex Scott is the founder of the Utah chapter of Black Lives Matter, and she wants police to stop killing people of color. The Salt Lake City Police Department recenty released body camera video of the April 18 shooting death of 32-year-old Delorean Pikyavit, an American Indian. In addition, Elijah James Smith, 20, a black man, was shot and killed by West Valley Police on April 8. He was unarmed. Smith was suspected of stealing a cellphone. Scott, a Utah native, wants to propose legislation that would require independent civilian police review boards that could mete out punishment for wrongful acts. The proposal, developed by Utah Against Police Brutality, also would demand better police training and guarantee that police bodycam video be released within 24 hours, unedited and with sound. She does not yet have legislative sponsors for a bill. Even if such legislation were to pass, it might not be enough to end all police shootings in Utah. 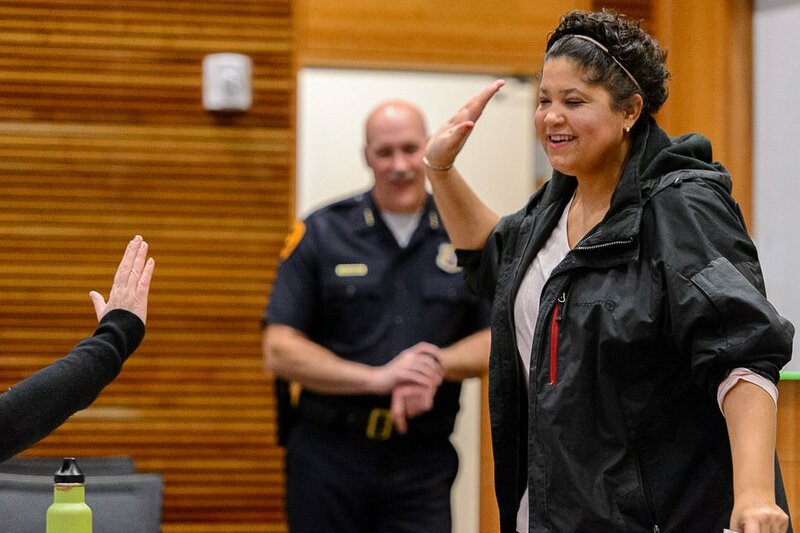 As Salt Lake County District Attorney Sim Gill has said on numerous occasions, under state law, if an officer feels threatened, he or she may use lethal force, even if he or she does not see a weapon. The West Valley City police shooting of Smith is similar. An officer ordered Smith, a black man, to take his hand out of his pocket; when he did, the officer shot him. Smith did not have a gun. Police said Smith may have had a screwdriver. “People of color should be able to live in a world where they don’t have to be afraid of police,” Scott said. Scott conceded the criteria for using lethal force must also be addressed to reduce shootings of unarmed civilians. 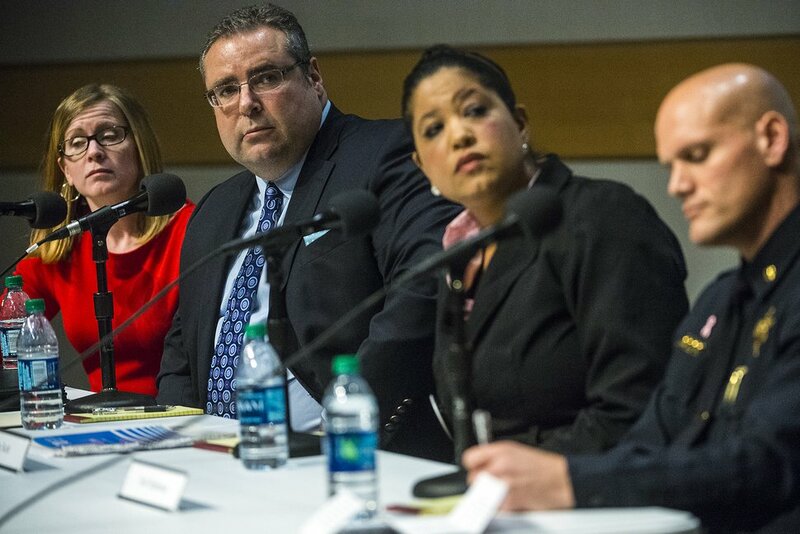 Chris Detrick | The Salt Lake Tribune (L-R) Salt Lake Tribune reporter Erin Alberty, former West Valley City Police Chief Lee Russo, activist Lex Scott and POST director Scott Stephenson participate in a town hall, "Deadly Force: A Community Response to Police Shootings," at the Salt Lake City Main Library on Feb. 19, 2015. Her comments were made April 30, two days before the video of Pikyavit was made public. In that case, police responded to a domestic violence call in Sugar House. The footage shows Pikyavit on the porch, saying to police, “Shoot me.” Pikyavit was holding a knife, and when he stepped off the porch, he was shot and killed. After viewing the video, Scott said Salt Lake City police should have made a better effort at de-escalating the impasse and also should have used nonlethal force. In fact, a police negotiator was on hand. One officer did use a nonlethal soft-bullet weapon. But another used an assault rifle that killed Pikyavit. On the wall of the modest office of Black Lives Matter off Van Winkle Expressway in Murray, Scott points to a dozen photographs of people who were killed by police. Among them is Darien Hunt, the 22-year-old African-American who was carrying a sword when he was shot in the back by police in Saratoga Springs on Sept. 10, 2014; and Patrick Harmon, 50, a black man shot and killed by Salt Lake City police while resisting arrest Aug. 13, 2017. “We want police accountability and transparency,” Scott said. Scott also is a member of a community group that meets regularly with Salt Lake City police to discuss ways in which police and community members can better interact to reduce violence. Trent Nelson | The Salt Lake Tribune Lex Scott of Black Lives Matter — Utah gives a high-five at a meeting of the Community Advisory Group, Wednesday, Jan. 18, 2017. The CAG meets with police and city representatives every other week. At rear is Salt Lake City Police Chief Mike Brown. Salt Lake City Police Chief Mike Brown gets high marks from Scott for what she called his progressive measures, including better training for officers and his openness to discussing issues with residents. Still, she said, there is a long way to go. Police spokesman Detective Greg Wilking, in turn, gives Scott accolades for meeting with Salt Lake City police along with other members of the community group. On the other hand, an independent review board with the authority outlined by Scott most likely is not viable in Utah, Wilking added. Salt Lake City does have a Civilian Police Review Board, instituted by former Mayor Rocky Anderson, but it is not independent of the municipality. It can make rulings on whether an officer acted outside official policy but cannot dole out discipline. Scott said the board is not independent and transparent enough. Similarly, West Valley City has a Professional Standards Review Board made up of residents that can review citizen complaints, including “all use of force occurrences.” But like Salt Lake City’s board, it cannot bring charges. That, Wilking said, is left up to the district attorney, an independently elected official who has the authority to bring criminal charges in any police action. Black Lives Matter has alarmed many white people across the country after protests in places such as Ferguson, Mo, where 18-year-old Michael Brown was shot and killed by an officer in August 2014. Black Lives Matter is a civil rights movement, Scott explained, not — as some have mischaracterized it — a militant and violent organization. Although Black Lives Matter was initiated by Patrisse Marie Cullors-Brignac in the aftermath of the Feb. 26, 2012, shooting death of 17-year-old Trayvon Martin in Sanford, Fla., each community can form its own chapter, Scott explained. She launched Utah’s group in October. Rather than an organization, she explained, it’s a decentralized movement, much like the civil rights movement of the 1950s and ’60s. The Utah chapter — about 125 members strong — has organized a number of protests in Salt Lake City that, among other things, blocked streets and resulted in traffic snarls and confusion. The movement seeks to make white people uncomfortable in their privilege, Scott said. Scott often gets death threats. She also has received anonymous messages threatening her children. It’s the price, she said, for leading the cause in Utah.